But please educate me: what is this? I don't know what fruit it is, but am sure it is a multiple fruit. Each fruit has that remains of the style still there. I wonder if it is a relative of Artocarpus species. Maybe each fruit has a small seed inside. I was going to say osage orange also, but it's hard to tell how big it is? Yup - that's gotta be it! 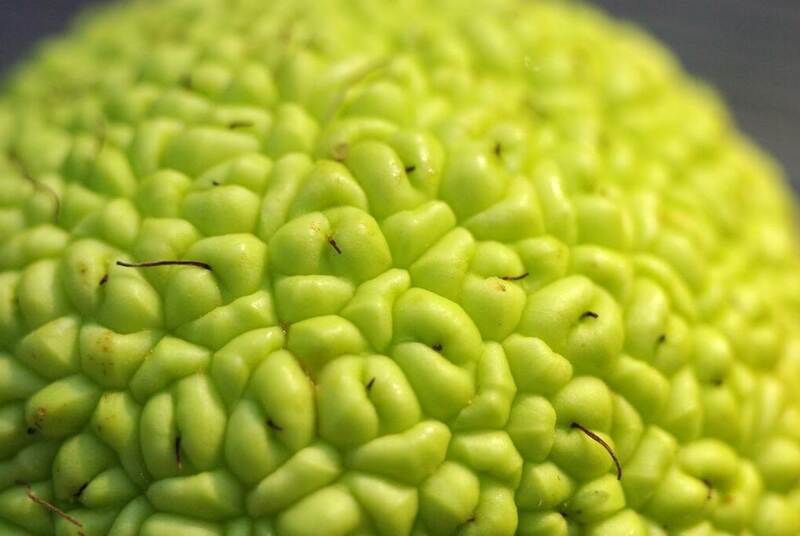 It's an Osage orange as the others have said. A couple years back I bought a few as decorative items for a bowl on the table, be careful they can emit a sticky substance that's hard to clean up! Cool though eh? My husband's family had them growing on the farm back in Nebraska. we call'em hedge apples. 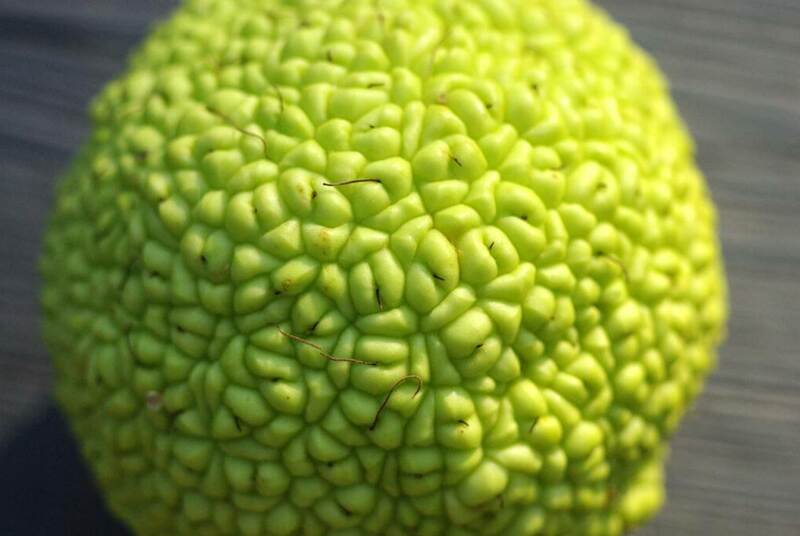 Osage orange is the the tree, hedge apples are the fruit. some say the scent keep roaches away. not sure about that though. Osage oranges are a great natural insect repellent in the garage or basement. Cut into pieces and throw them in an unobtrusive place. Osage orange wood is very dense and withstands rot so we use it quite extensively for perches or propping inside animal exhibits. "The belief about the use of hedge apples for insect control is widespread and persistent. it is claimed that placing hedge apples around the foundation or inside the basement will repel or control insects. A few years ago, Iowa State University toxicologists extracted compounds from hedge apples. When concentrated, these compounds were found to repel insects. Scientists also found that natural concentrations of these compounds in the fruit were too low to be an effective repellent. So, don't be fooled into spending much to use hedge apples as an insect repellent." 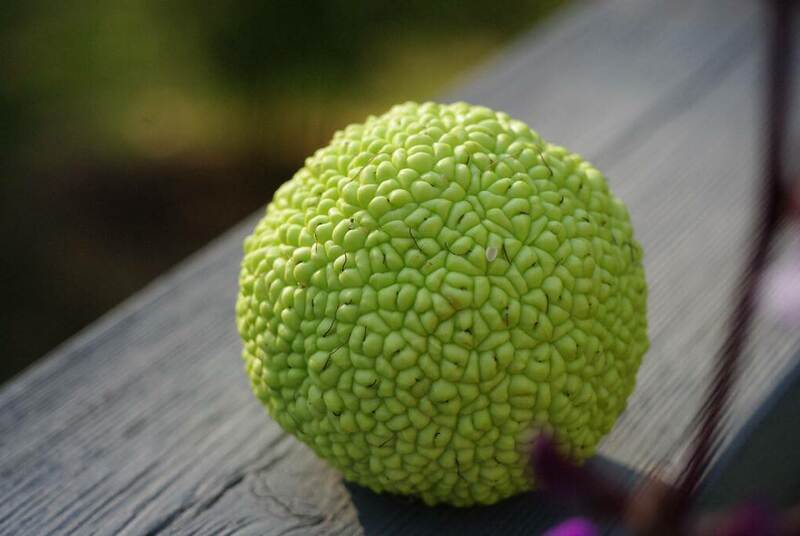 It's certainly a hedge apple, also known as an Osage orange. They come into season late summer/early fall. In Kansas, early settlers used hedge trees as row lines to delineate the boundaries of their farmsteads since there was not an abundance of trees for wood fences. Many of these tree lines still exist. I live in the suburban KC area and it's not uncommon to still find a row of hedge trees in the backyards where two different subdivisions meet. The developers left the trees in place when fields and pastures were turned into residential neighborhoods. Supposedly the hedge apple repels spiders but it's probably an old wives tale. heather is absolutely right. It is a hedge apple. Ol' Martha Stewart has used them in some of her autumn decorations. I think they are great! I found one of these when I was a kid . . . and I would have sworn it was breathing! Had me freaked out . . .
We call them 'horse apples' in north Texas. They come from the Bois d'arc tree. 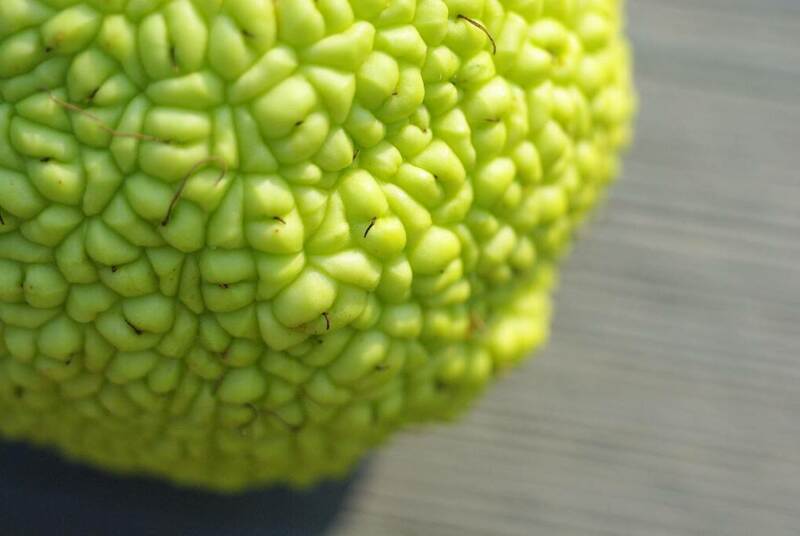 Yeah, Osage Orange. There are male and female trees and the female trees will still produce these oranges/horse apples/whatever you want to call them regardless of if they are pollinated are not. They just won't produce viable seed.